KANSAS CITY, MO and GLENVIEW, IL, August 14, 2018 – Orange EV and Firefly Transportation Services today announced the deployment of Orange EV T-Series pure electric terminal trucks into yard management operations for a leading manufacturer of consumer packaged goods. Providing emission-free yard management services at manufacturing and distribution facilities in Michigan and California, Firefly will reduce costs and add new KPI reporting and tracking capabilities while supporting customer sustainability goals. Orange EV’s industry-leading fleet of Class 8 battery-electric trucks, commercially deployed since 2015, recently surpassed 575,000 miles and 161,000 “key on” hours. Fleets using Orange EV trucks have repeatedly affirmed increased reliability and driver satisfaction as well as reduced maintenance and downtime. With operational cost savings of $20,000 to $60,000 annually, total cost of ownership of an Orange EV electric is often significantly less than that of a diesel. Through state-of-the-art technology, Firefly Transportation Services is revolutionizing the spotting services industry. 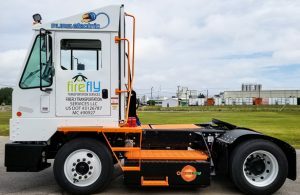 Firefly provides 100% electric trucks for yard management operations to create a safer and healthier work environment, support fleet sustainability goals, and reduce operating costs. For all spotting and shuttling services, Firefly delivers advanced analytics, KPI reporting, and in-depth business reviews. With nearly 75 years of combined experience in transportation, logistics, and supply chain management, the Firefly leadership team has deep industry expertise and is committed to improving clients’ bottom line productivity.